Family Computer Golf: U.S. Course (ゴルフUSコース) is a Japan-exclusive golf game released for the Family Computer Disk System on June 14, 1987. It is a golf game starring Mario and Luigi. It is similar in gameplay to the earlier Golf and the later NES Open Tournament Golf. The courses in the game are based on real-life courses in the United States of America. It is also a companion title to Family Computer Golf: Japan Course, a similar game released a few months earlier, which had courses based on real-life courses in Japan. Like its predecessor, the game comes on a blue disk, meaning it is compatible with the Disk Fax, a device found in public places across Japan such as department stores. These machines would send the player's saved games and high score information to Nintendo. Nintendo held a contest centered around this game, and winners received a special version of the game that came on a gold disk. This version was harder and had an extra course added in. 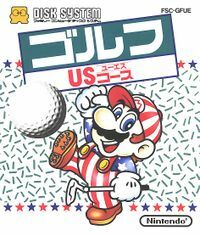 Super Smash Bros. for Nintendo 3DS / Wii U: One of Mario's palette swaps is based on his stars and stripes based clothing in Family Computer Golf: U.S. Course, although NES Open Tournament Golf is more frequently cited. Super Mario Odyssey: The stars-and-stripes clothing once again appears. Super Smash Bros. Ultimate: Mario's palette swap based on his outfit from this game returns. ↑ Sakurai (July 10, 2014). Twitter. Retrieved November 26, 2015. This page was last edited on March 26, 2019, at 17:23.